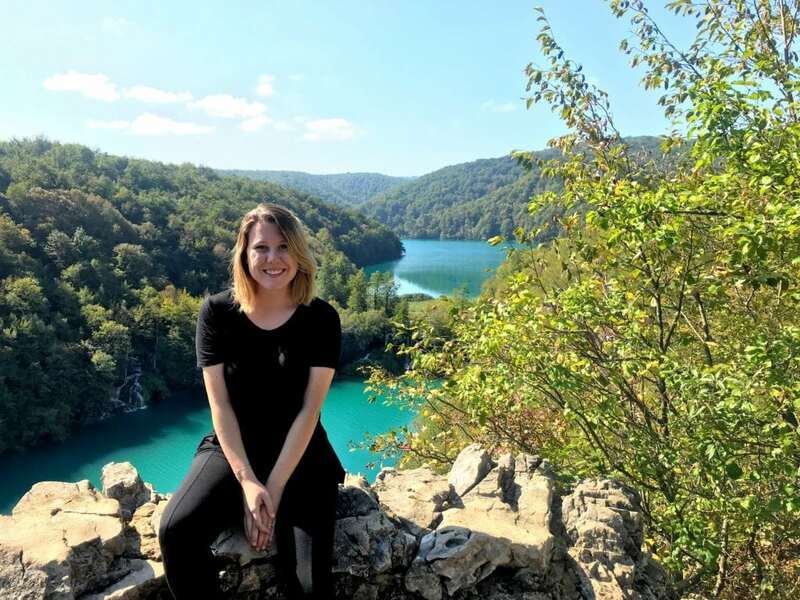 I knew I wanted to visit the Plitvice Lakes during my stay in Zagreb, but I was scared off by the high cost of accommodation around the park. Instead, I decided to attempt it as a single day trip, and I’m happy to report it was totally successful! The Plitvice Lakes are far from a budget destination, but visiting them on a day trip instead of overnight excursion can help cut costs. 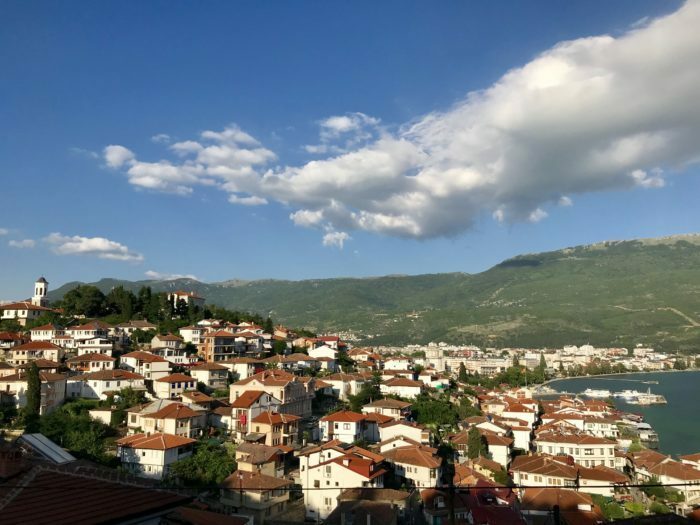 If you’re ready to see one of the most beautiful places in the Balkans (and possibly the world) then this guide to visiting the Plitvice Lakes is for you. In a surprising feat, Croatia has actually made it quite easy to buy bus tickets online. Simply visit the website to see the timetable and then click “buy.” If you want round trip tickets, click the dropdown option and choose “P” before you head to the checkout page. 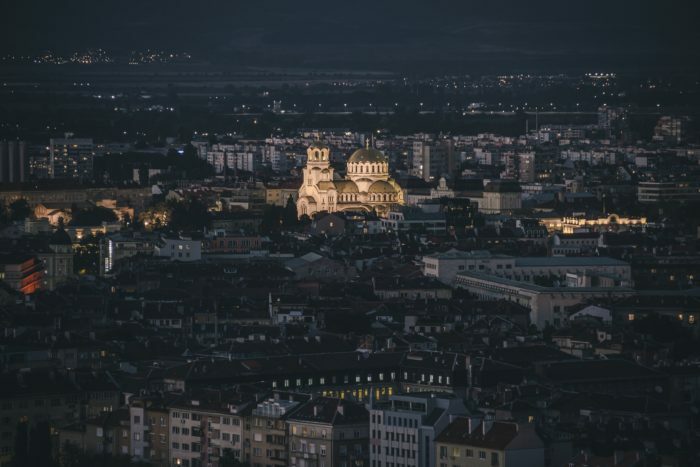 The buses leave from the Zagreb Main Bus Station (Autobusni Kolodvor) and when you buy your tickets online they’ll be emailed to you. Go to the station on the day of your trip and go to the ticket booth on the second floor. (It spans an entire wall and is impossible to miss because it’s labeled with a giant blue and yellow sign.) They’ll print your tickets for you and then you can board the bus – easy! In September 2018, our round trip tickets from Zagreb to Plitvice Lakes National Park and back again cost 135 kuna / 21 usd each. This let us save some money on the trip but it was a mistake. I don’t recommend buying round trip tickets because you’ll be locked into a late return. The only available options for us with the company were 5:50 pm and 6:40 pm. We were ready to go around 4 pm and watched multiple buses heading to Zagreb pass by, load up, and leave us behind. 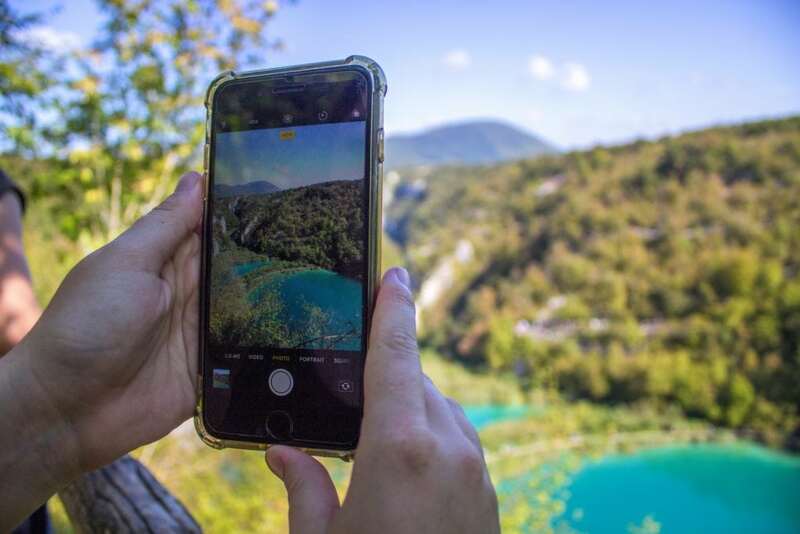 If you choose to buy a one-way ticket out, you can make a reservation for your return on an earlier bus at the small stop when you get dropped at the Plitvice Lakes. Whichever way you choose to get to the Plitvice Lakes, the bus will drop you off right at the main entrance and you’ll be ready to start your day! 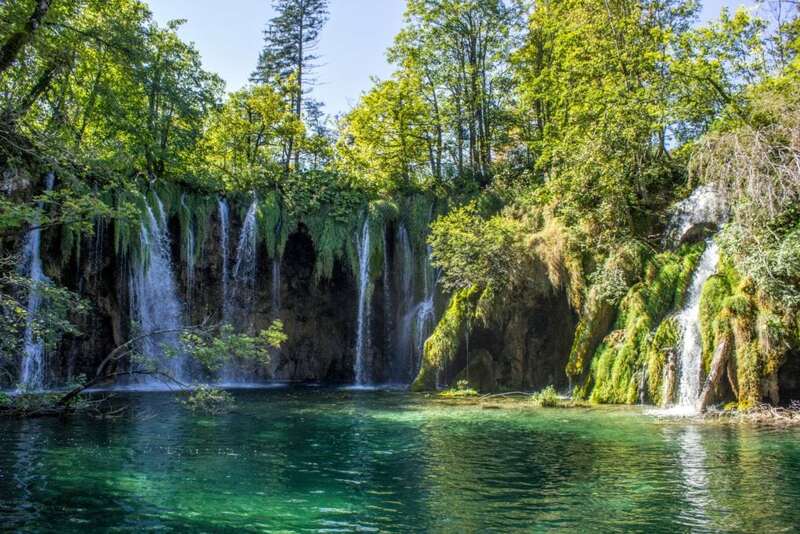 How Much Does it Cost to Visit the Plitvice Lakes? Like I said above, the Plitvice Lakes day trip is not budget-friendly. First, the bus was 270 kuna / 42 usd for two round trip tickets. Then, we bought our entrance tickets to the park. There are three different prices for entrance tickets depending on the month you visit. If you’re planning to buy water, beer, snacks, or lunch factor in those costs as well. Daniel and I packed our lunch and after seeing the sparse options at the park I strongly recommend this route as well. There’s a nice picnic area in the shade in the park that’s perfect for a lunch break. I strongly recommend avoiding a day trip to Plitvice Lakes in the high season. We went in September and the crowds were honestly unbearable. If we had gone in July or August instead they would be even worse. Plus, temps would be hotter and entrance is more expensive in those two months than any other. With all three of these factors combined, there’s no way it would be enjoyable. 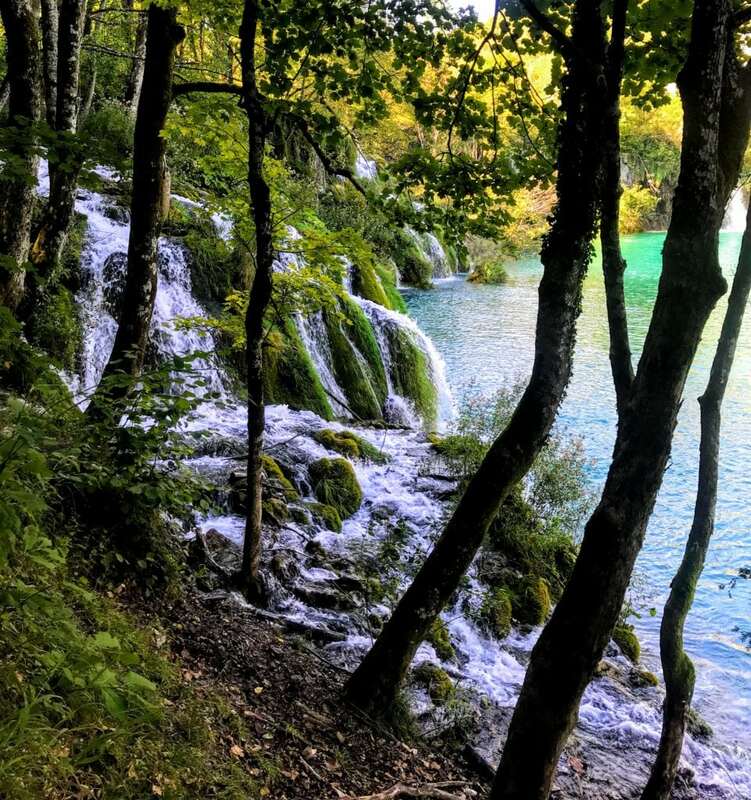 If you’re only going to be in Croatia for a short amount of time and it coincides with the high season, consider a trip to the less visited Krka National Park instead. There’s an information booth at the entrance to the park where you can pick up a free map. Take a minute to chat with the workers and ask any questions you want about the park. There are a few main routes and the most popular one is “Route C.” The trails are marked pretty well but I’ll let you in on a little secret: There are extra hiking trails that you can take instead of the main boardwalks. They’re less crowded and will give you a bird’s eye view of the lakes. If you’re on Trail C like us, walk up the giant staircase at the Big Waterfall (I promise you can’t miss it) and you can follow a trail all the way to the boats. In Plitvice Lakes National Park all of the boats and shuttles are free with your entrance. You can choose to explore completely by foot or speed up the journey with the shuttle and boat. We did this and still walked a solid 7.5 miles on route C.
There are also shorter and longer routes to suit any fitness level (find all the details here). The very start of the park at Entrance 1 is also the most beautiful with a view of the lower lakes and the big waterfall. The middle of the park, where the boat will drop you off, is the second best part. Route C will then take you beyond these to the upper lakes. These are nice, but the least photogenic of the three areas so you won’t miss too much if you opt to skip it. 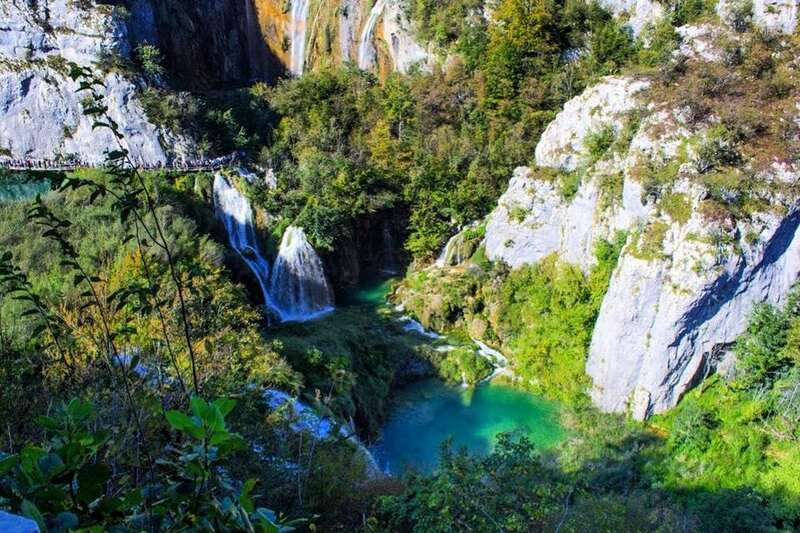 Are the Plitvice Lakes Worth Visiting? 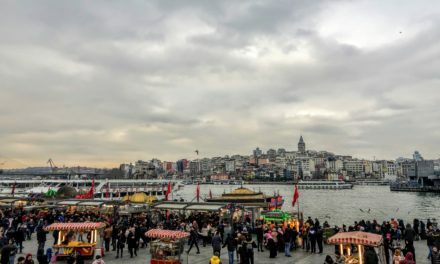 I’ll finish my day trip guide with my personal opinion on the experience. Honestly, I left the lakes feeling a bit disappointed. I had seen so many gorgeous photos of the park and I couldn’t way to see it for myself. However, the park was so crowded it really made me feel weird. I mean, we come out into nature to get away from it all but instead, I found myself waiting in lines, jostled left and right, and pretty much walking through crowds from start to finish. Everyone was taking pictures non-stop (me included) and… I don’t know. It just kind of felt like we humans came in and totally ruined the spirit of the area. It’s no longer a place to enjoy nature and instead just a backdrop for an Instagram photo. I’ve never been to a national park this crowded before and I really hope that I never experience it again. Still, the park really was as gorgeous as it looks in the photos. Hopefully, someday I can come back in the early spring or late fall and catch it in a more serene season. 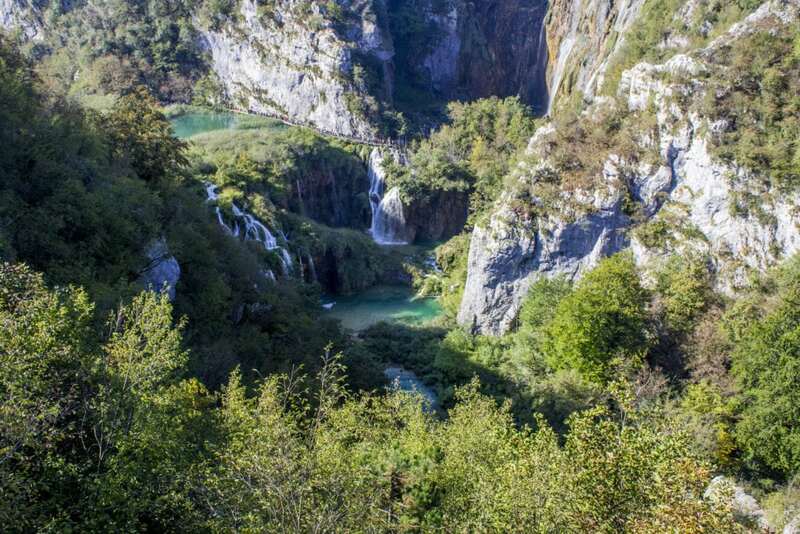 This quick guide will help plan a day trip from Zagreb to Plitvice Lakes National Park and just have a better idea about what to expect when you go. Plan to spend the whole day here and to be exhausted when you return! We caught the 7:30 am bus from Zagreb to the lakes and didn’t get back to the city until around 9 pm. Remember to pack a lunch, don’t buy round trip tickets (but do reserve your return when you arrive at the lakes) and try to visit outside of the high season. 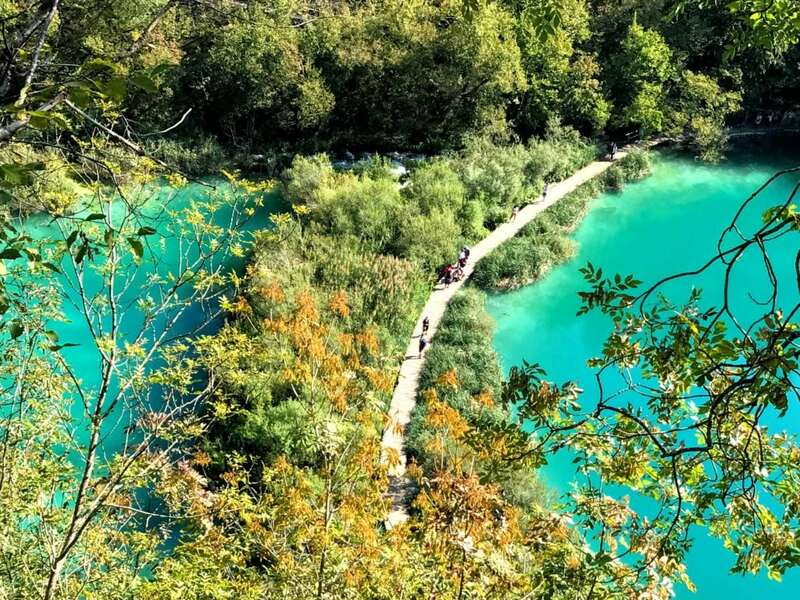 Keep these tips in mind, have an awesome time, and enjoy exploring one of the most beautiful places in Croatia on your day trip to Plitvice Lakes! 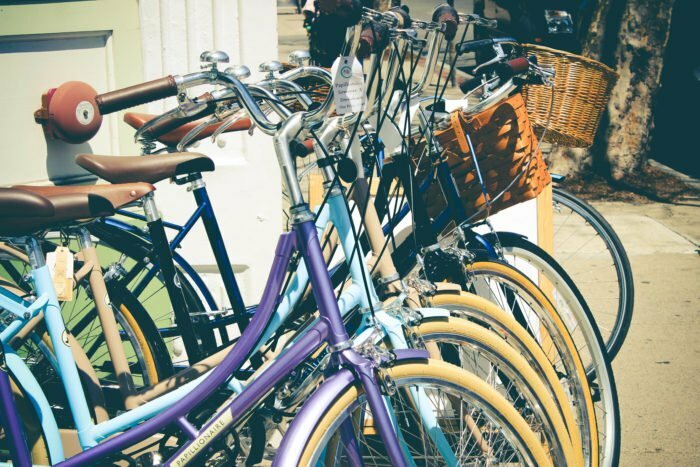 PS plan another super simple day trip from Zagreb to the town of Samobor or browse the Croatia Guide for more helpful articles about the country.